Valtteri Bottas says he was always expecting to run long at Monza and stressed his race was not "sacrificed" in order to help Lewis Hamilton. Valtteri Bottas insists his race was not “sacrificed” to help Lewis Hamilton secure victory at the Formula 1 Italian Grand Prix, adding Mercedes stuck to its pre-race strategy plan. Bottas lost out to Red Bull’s Max Verstappen at the start and dropped to fifth off the line, but gained a position to move back into fourth when Sebastian Vettel was sent spinning to the rear of the field following a clash with Hamilton. The Finn ran a long opening stint and found himself in the lead of the race when Kimi Raikkonen and Hamilton pitted, before he was tasked with holding up his fellow countryman to enable his teammate to close up. Bottas ultimately stopped on lap 36 after Hamilton had reduced Raikkonen’s advantage and went on to take third, while Hamilton passed the Ferrari driver to claim an important win and extend his championship lead to 30 points. “When we went through everything, all the scenarios for the race, we saw that with me starting fourth and Lewis form third behind the Ferrari, we saw no point for us to try and opt for the optimal strategy and saw an opportunity for me to go long,” Bottas explained. 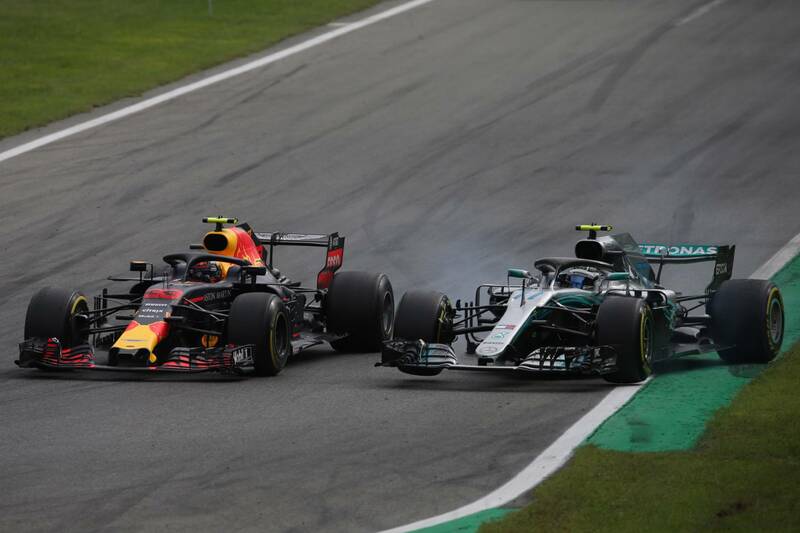 Bottas finished fourth on the road but inherited the final spot on the rostrum after Verstappen was hit with a five-second time penalty for causing a collision as the pair came to blows under braking at Turn 1 when Bottas attempted an overtake. He backed the stewards’ call to punish Verstappen, a decision which prompted an angry response from the Dutchman. “I think there was a couple of proper overtaking opportunities for me and the first one, I went inside and he just cut the chicane to stay ahead of me,” Bottas said. “The second time, I think there is a very clear rule that once you defend you choose your line and if another car is there you need to leave a car’s width and obviously he didn’t.